LONDON--(BUSINESS WIRE)--The craft spirits market in the US is expected to post a CAGR of close to 26% during the period 2018-2022, according to the latest market research report by Technavio. A key factor driving the growth of the market is the rising demand for craft spirit among millennials and Gen X consumers. Consumers, especially young consumers in the millennial and Gen X groups, seek authenticity in terms of quality and techniques used for manufacturing alcoholic beverages, such as spirits. Moreover, many millennials and consumers of the Gen X group show a high inclination toward craft products and ask for more than just taste and ease of purchase. This is because they want to learn about the product, its history, and the traditions involved in the manufacture. Small-batch products are also becoming popular, with one in seven new products that were introduced in 2016 being craft or small batch spirit. During the forecast period, the demand for craft spirits is expected to increase at a fast pace among millennials and Gen X groups in the US, which will eventually raise the revenue of the craft spirits market in the US. This market research report on the craft spirits market in the US 2018-2022 also provides an analysis of the most important trends expected to impact the market outlook during the forecast period. Technavio classifies an emerging trend as a major factor that has the potential to significantly impact the market and contribute to its growth or decline. Several alcoholic-drink players are actively pursuing deals, in the form of acquisitions or taking minority positions. In some cases, the focus of these players lies in filling the portfolio gaps by acquiring brands with the craft label to capitalize on the trust that consumers have developed for small brands. Currently, many alcoholic-drink manufacturers that traditionally focused on beer and wine have also been evaluating options to tap into this trend. They are also trying to expand by adding some craft labels to their portfolio, consequently, boosting sales for the overall craft spirits industry. “With several millennials and consumers of the Gen X willing to pay premium prices for fresh brands, many vendors are taking strategic initiatives to form acquisitions and pursue deals to capitalize on the interests of the consumers and enhance the overall growth of the market,” says a senior analyst at Technavio for research on food and beverage. This market research report segments the craft spirits market in the US by product to include craft whiskey, craft gin, craft vodka, other craft spirits. The craft whiskey segment led the market in 2017 with a market share of more than 37%, followed by craft gin and craft vodka respectively. However, during the forecast period, the craft vodka segment is expected to show the highest incremental growth, followed by the craft gin segment. 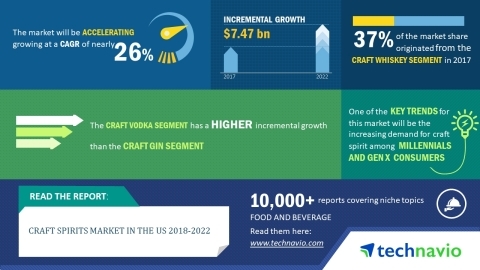 The craft spirits market in the US is expected to post a CAGR of close to 26% during 2018-2022, according to the latest research report by Technavio.